Allow us to welcome you, as our guests, on an exceptional hunting experience. As we enter our 16th year in business, one must reflect on the world-class waterfowl hunting and life long memories that have been created for our clients and ourselves. We thoroughly enjoy our guests and look forward to accommodating old friends, as well as some new faces next year. Please feel free to contact us at 1-866-453-9270 or by email, as we are always interested in hearing from fellow hunting enthusiasts. The most important component of a good waterfowl hunt is spotting, which is why our intensive spotting program is the backbone of our success. We spend many hours spotting each day and log thousands of miles every week to ensure that you are hunting the best possible fields in the days to come. While you are in the field hunting with your guide, the other guides are on the road spotting for your next hunt. We also have people in other parts of our operating area keeping track of things there for us, to ensure that our hunters are where they need to be for the best waterfowling action available. We don’t quit spotting early just because we already have a field lined up for your next hunt. We spot until the birds go back to the water so we can pattern the birds where you’ll be hunting in future days. Once the spotting is done and the best shoot has been found, your guides rely on their vast waterfowl hunting experiences to devise the best method (decoy numbers, decoy patterns, hunter placement, etc.) to pursue the birds. When combined with a collection of thousands of top quality goose and duck decoys for different situations, and an unbelievable waterfowl population, you have what it takes to experience the best that waterfowl hunting has to offer. Goose hunting is done in harvested grain fields where we observed geese feeding in previous days. Geese that are abundant in our area are greater and lesser Canadas, White fronts (Speckle bellies), Snows, Blues, and Ross geese. This offers our clients some real variety and the chance to pursue what they prefer. Dark geese are usually hunted using full-body decoys from layout blinds for cover. This provides good up-close viewing and shooting access as well as safety for the hunters. White geese are usually hunted using 500+ windsock type decoys and an electronic call from layout blinds with snow covers or with the hunters wearing white suits and laying on inclined backboards amongst the decoys. We usually shoot a lot of dark geese and ducks in the white decoys as well as they are accustomed to feeding together. Under the right conditions, pass shooting can also be very productive. Duck hunting usually involves an evening field shoot over decoys for big Northern Mallards with the help of spinning wing decoys. Mallards and Pintails are also commonly taken over the goose decoys during the morning goose hunt as they come out to feed. Many of our hunters leave here with memories of a “duck tornado” like they have never imagined. We very seldom hunt ducks over water as this is their safe haven which is imparative to keeping them in our hunting area. However hunting small potholes on years with plentiful water can be very productive as well. If you like a big target, Sandhill Cranes are numerous in our area and offer some exciting shooting over decoys or pass shooting in the evening. We are located in one of the premier staging areas for Sandhill Cranes in all of North America. If you have never hunted Cranes before you owe it to yourself to experience it first hand. Known locally as Pteradactals, Storks, Turkeys, Gooney Birds, & Buzzards, many clients consider shooting low flying Cranes, one of the highlights of their trip. 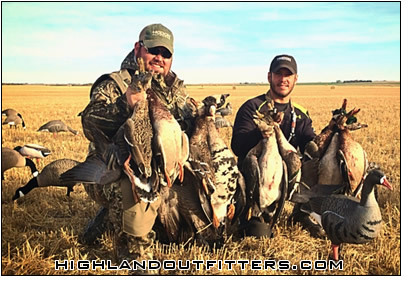 With very liberal bag limits and an abundance of ducks, geese, and cranes, waterfowl hunting opportunities in our area of Saskatchewan are outstanding. Sharp-Tailed Grouse and Hungarian Partridge also call our area home. You can burn some calories chasing these heart stopping birds in the hedgerows and along the edge of the grain fields and pastures. Expect an early morning start as we head in to the field to set up our morning spread before daylight. We will commonly put out 1000 plus quality windsock decoys along with flyers while utilizing an electronic call to bring them in. You will have one guide with you in the field in the morning while your other guide is out locating birds for your hunt tomorrow. We are traditionally in the field for a longer time in the spring as the geese can fly all day. However, packing up around noon and heading back to the lodge for a hearty afternoon lunch is typical. But that doesn’t mean your hunt is over for the day, quite the contrary! 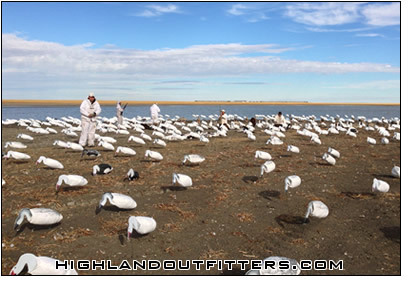 Highland Outfitter’s lodge is located on high ground with an elevation of approximately 2000 feet in the midst of the snow goose migration flight path. You can take advantage of this by going freestyle hunting in the complete decoy spread where you can see for miles set up on high, private Highland home property in the afternoons and evenings after our morning guided hunt. The camp spread is walking distance from the lodge so you can come and go freestyle hunting as you please. A true piece of paradise to hunt migrating geese from in a field spread during the afternoons and evenings. Your guides will be out lining up your next morning shoot for you. You can be in the field all day if you like or spend your spare time in the afternoons or evenings at the lodge watching the game on satellite TV if you prefer. You can even pass shoot right from the deck just like we do as the geese fly over the lodge. Bottom line is you get a fully guided day hunt and then get to spend the balance of your time as you choose, whether that means more hunting, catching a nap at the lodge, or sitting on the deck enjoying a drink and watching the migration.